The 2016 ICSC Mid Atlantic Conference was held again this year at the Gaylord Convention Center at National Harbor in D.C. this past March. This year’s attendance was over all positive and energized for the CRE Mid-Atlantic markets. Expected players were in attendance along with several new concepts that were making their first time market impressions. Still, at the end of the day, quick serve restaurants (QSR) continue to dominate the retail market place and overall activity. The unfortunate days of Chipotle are expected to continue with the decline in annual sales and overall market share. While not an ideal situation for Chipotle, it has started to open the door to many new up-and-coming concepts. Eight of the 13 featured runway retailers during the Mid-Atlantic ICSC Conference were food-based users. New to the mix for the area included B Bop Q, a Korean-themed QSR, and Halal Guys which offers a mix of Middle Eastern wraps, sandwiches, and bowl choices. Other newcomers to our area are in the convenience store categories, C-Stores. Dash In, Rutters, and Circle K are throwing themselves into this arena as they seek growth in the Mid-Atlantic region. As consumers continue to lead lifestyles that are on-the-go, and with the number of dual-income families on the rise, we can expect to see both continued growth and diverse options entering the QSR category. Another focal point at the convention was mixed-use construction. Increasing amounts of developers are seeking opportunities for mix-use developments due to encouragement from numerous City and States for such uses. Recent studies and reports are beginning to reveal that the “live, work, play” mentality is expanding past millennials to include growing interest from the “younger” portion of the baby boomer generation. Individuals in this group are proving to prefer interaction with mixed groups of people rather than living and socializing with only people their age and older (i.e. 55 and older communities). As this trend continues to develop, it should help to absorb current inventory among the residential portion of already existing mixed-use projects and available land inventory for continued development, spawning new growth in outlining areas of the Mid-Atlantic region. On a local level, we are waiting for the anticipated start of Greenberg Gibbons’ $20 million renovation to the Shops at Kenilworth in Towson and continue to watch the active construction unfold at the Foundry Row development in Owings Mills. Slated to begin this spring, renovations at Kenilworth will include major interior and exterior upgrades as well as a three-story addition providing visitors new retail offerings, restaurants, and a roof top garden. As announced at the end of the 4th Quarter 2015, Trader Joe’s will also begin construction on their new space at Kenilworth this spring, occupying the second floor space currently home to Stebbins Anderson. Stebbins will be relocating in the project to the first floor. Foundry Row, the $140 million, 50-acre redevelopment site in Baltimore County, continues to add new restaurants and retailers to the Owings Mills market place, signing 11 new tenants during the 1st Quarter 2016 bringing the project to 88% leased. 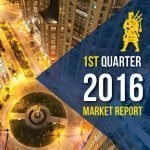 CLICK HERE to view MacKenzie’s 1st Quarter 2016 Retail Report for the Baltimore Metropolitan Area.